This is my first post for VNA. I am really excited to be part of this wonderful team and I hope you guys will like my posts. I love simple nail art designs and I rarely go for a plain manicure. 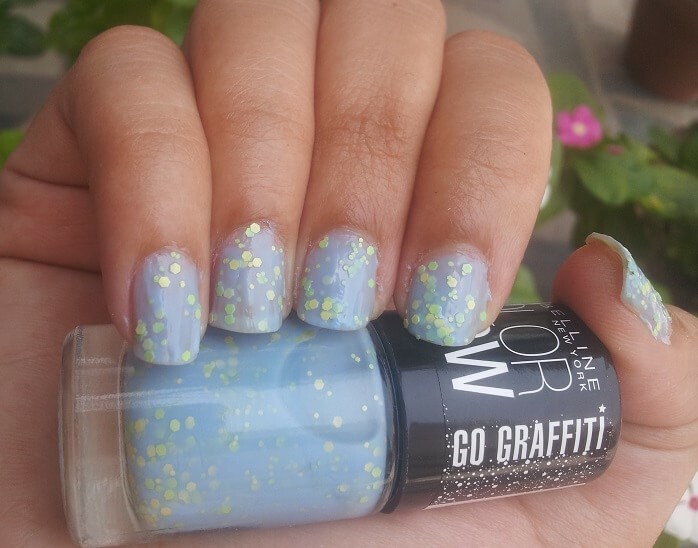 Therefore when I saw these new Go Graffiti Color Show Nail Colors at the Maybelline counter I was screaming inside my head. It was love at first sight, these are so pretty and give a break from regular plain nail polishes. Some of them were top coats and some were jelly type nail paints. 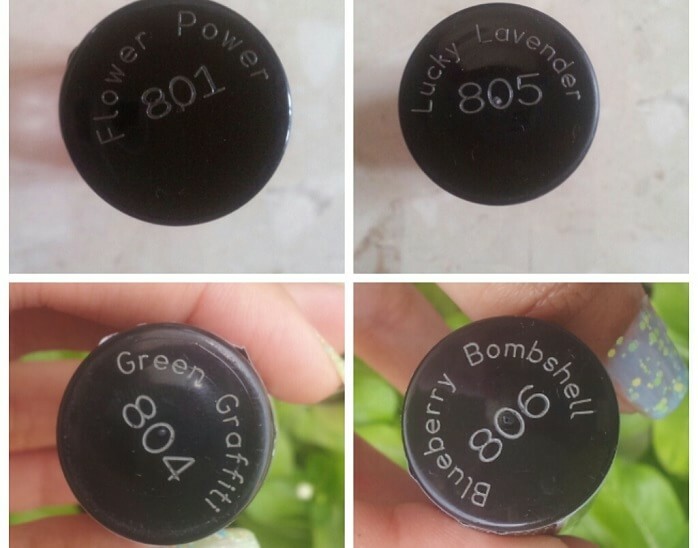 I bought these four shades which I liked the best and will review and swatch today: Flower Power, Blueberry Bombshell, Green Graffiti, Lucky Lavender. Let’s start with my NOTDs and see how these nail paints fare. 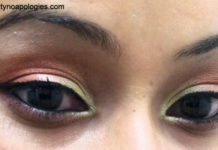 Has graffiti ranging from flowers to stars and hearts, to make you play with new looks every day. 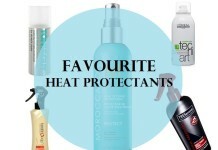 Has gel like dense formula that makes it easy to apply. 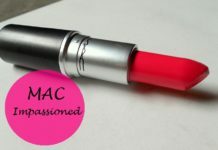 Avaiable in 9 different shades to steal your heart. 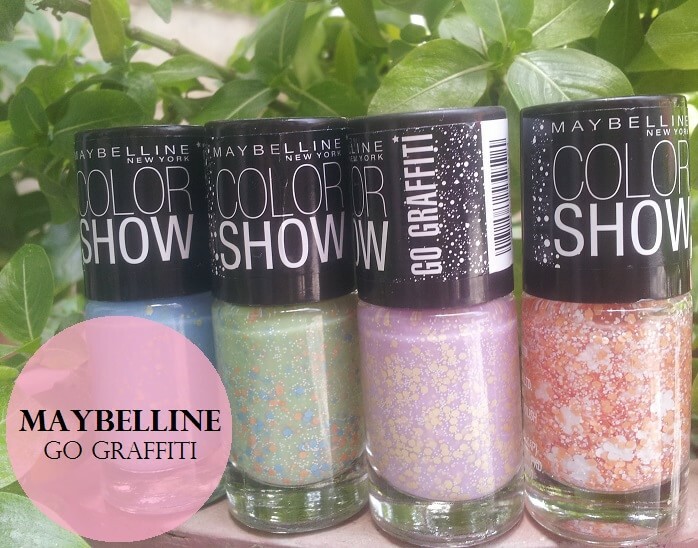 Additional Information: See magic of graffiti beyond walls, and on your nails, with the new Maybelline Color Show Go Graffiti Nail Paints. 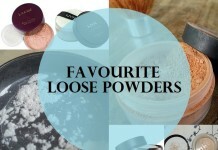 These are bound to give you that show stopper looks with the gorgeous shimmery sequins. Green Graffiti: This one is jelly like. Has light pastel green base with medium orange and blue hexes sequins and micro white dots. The texture is creamy, not too runny. It’s quite a sheer nail paint but two coats are enough to give and opaque finish and sandwiched hexes effect. Blueberry Bombshell: This is a blue jelly with neon green sequins in medium sized hexes and micro dots. 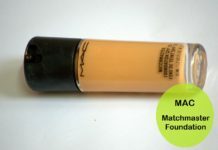 The texture is quite runny and this particular shade is very sheer. 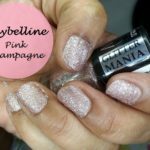 It still looks sheer after applying two coats and applying three coats will make it very crowded because of the sequins. 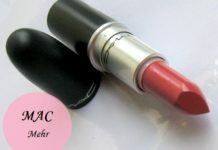 I suggest you apply a base coat with a similar colour (blueberry ice is similar to this one) or a white base coat. Lucky Lavender: A light lavender base with light orange hexes and micro dots, and white micro dots. The texture is similar to green graffiti. And I was able to achieve an opaque finish with two coats. 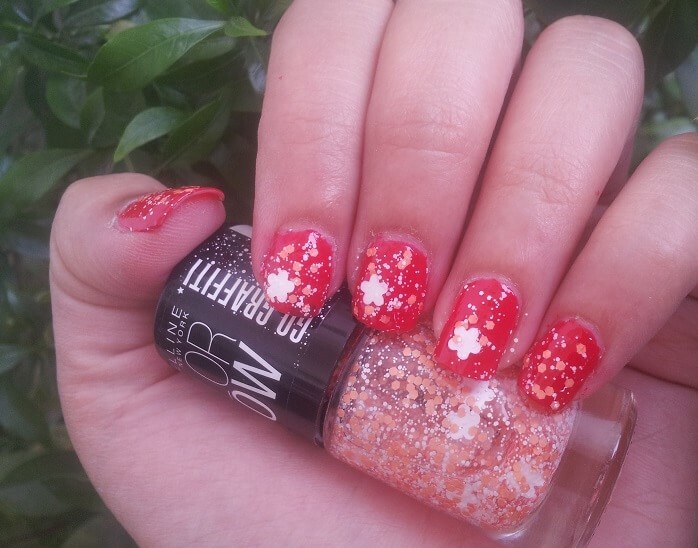 Flower Power: This is a top coat with clear base and medium peach orange hexes and micro white dots and hexes. It also has big give petal white flowers. The flowers made me buy this shade, but getting the flowers out of the bottle is like playing that game where you have to fish out a toy. And since the flower is quite big you have to be careful while placing it. I’ll suggest placing the flowers at corners to avoid the edges sticking out. This is a beautiful shade but I wish the flowers were a little smaller. Here I have applied one coat on top of a red nail paint. This will look great with dark base coats because of the white in it. 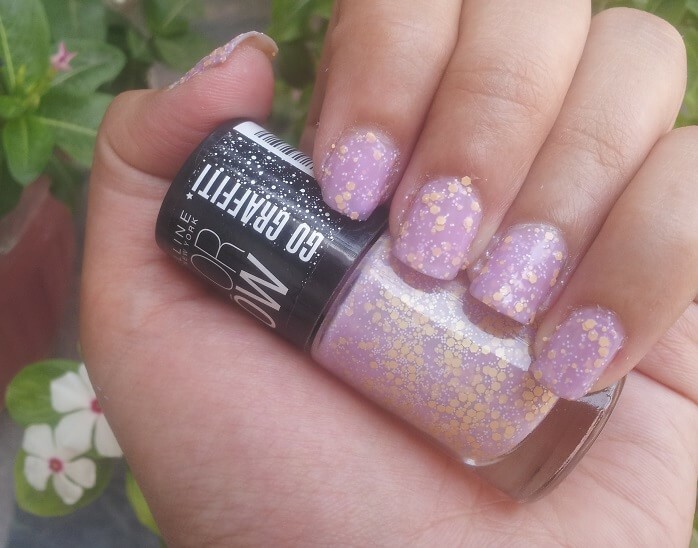 You’ll have to apply a clear top coat to avoid chipping of the sequins in them. These began to chip within a few hours without a top coat so the staying power totally depends on your top coat. 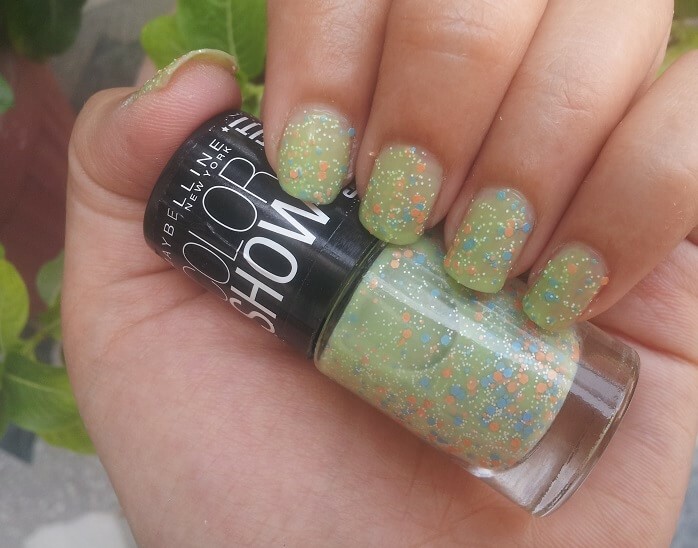 Removing them is a task just like glitter nail polishes, so you’ll have to follow the same techniques you do for glitter polishes. 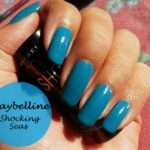 You can apply a layer of fevicol to your nails let it dry and paint your nails as you normally do. This makes removing these nail paints really easy. These are very versatile and you can get creative with these. 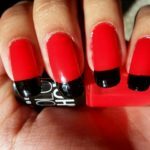 You can mix match these with the different shades, wear them as accent nails, create an ombre effect by concentrating the sequins at one half of the nail. Final word: This is a nice concept introduced by Maybelline. 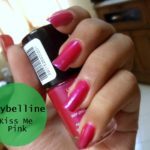 I have seen this kind of nail paints only in high end brands so far and I am very happy Maybelline launched them in India. I’ll be wearing these all summer and you should definitely try at least one from this collection. The only downside is the size of the flower sequins in flower power and pigmentation of blueberry ice. Apart from that I am totally in love with these. 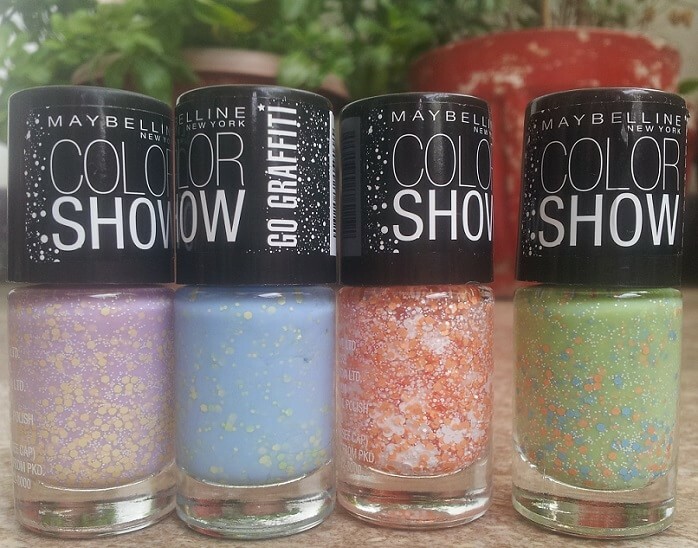 Have you used Maybelline Color Show Go Graffiti Nail Polishes? Share your reviews with us. First of all Nikanshi, it was a gr8 -well written review. loved the way you wrote. Secondly thanks for those handy tips which would really be of gr8 help. 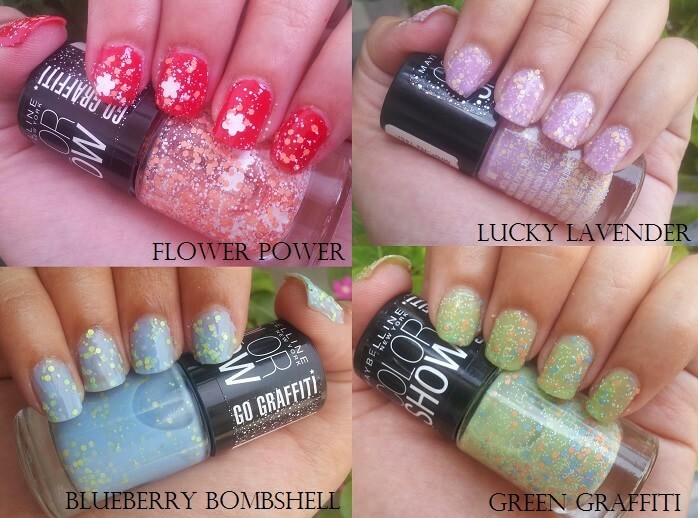 this nail paints are not available on amazon!!!! Love love looovee these ! I liked lucky lavender and green graffiti a lot! These launches are awesome, doing the nail art in just snap of finger. Would love to try them all !! Lovely review Nikanshi ! Thanks to all you lovely ladies for your sweet comments :*. Somehow I don’t really like these a lot. Is it just me? Or is someone not too much of a fan of these too?